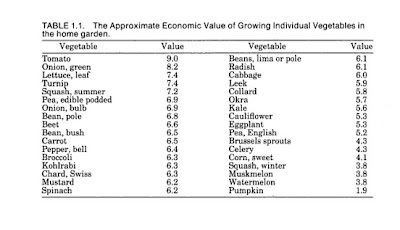 ...a garden of 150 sq ft produced enough vegetables to provide a return for labor of $1.08 per hr; and this value was calculated after all expenses, including depreciation on the garden tools, were deducted. Few leisure-time activities pay you for doing them. I'd love to know what that $1.08 figure would be in today's money. I wonder whether vegetables more expensive, relatively speaking, now, than they were then, for example? Organically-grown ones certainly are. These figures make a lot of sense to me. We've wasted considerable time and space growing pumpkins over the past few years, and as you can probably guess, pumpkin isn't a taste that Scots warm to. The plants at the top of the list seem about right for us. Our big challenge this year is to get on the right side of the 'effort to yield' ratio. Very envious of your bumper Canadian crops!